Trinity Sunday saw a member of our Youth Group make his first holy communion with his sister. And what a pleasure to hear our youth sing during the Mass for Ben and Maddy. As you can tell by the photo it was an amazingly happy occasion for one and all. 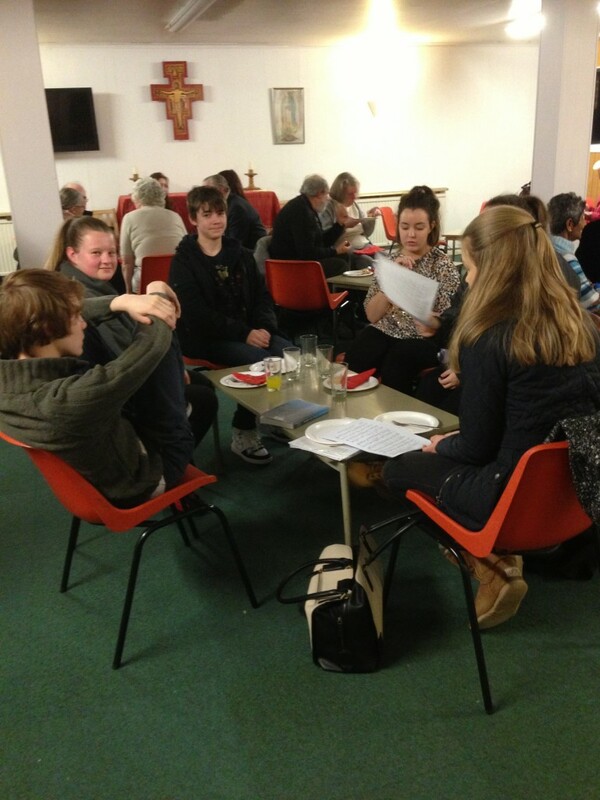 The youth raised £85.97 offering minced pies and mulled wine at Holy Angels ast Saturday, 7th December – all of us would like to say a BIG THANK YOU. 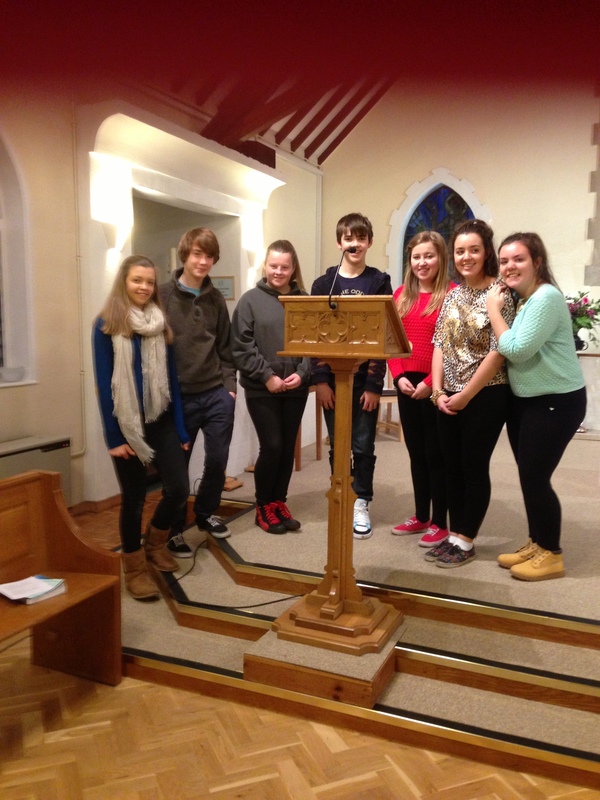 Our very brave youth group sang for churches together in Farnham at a Songs on Praise event on Sunday 26th January 2014. Brave because they had only learnt Sing A Simple Song Unto the Lord two weeks previously and sang unaccompanied. 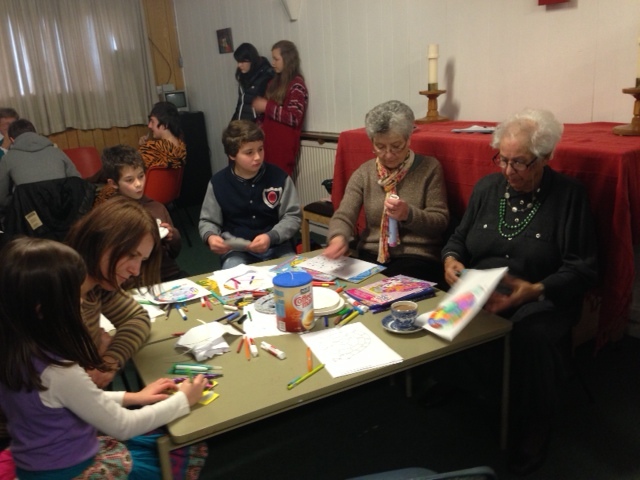 Well done our youth group our parishes should be proud of you all. Relaxing after their song over a nice cup of tea! The weather is a constant source of angst when planning large events and Confirmation Day was no exception with record cold days leading up to our youth’s special day. 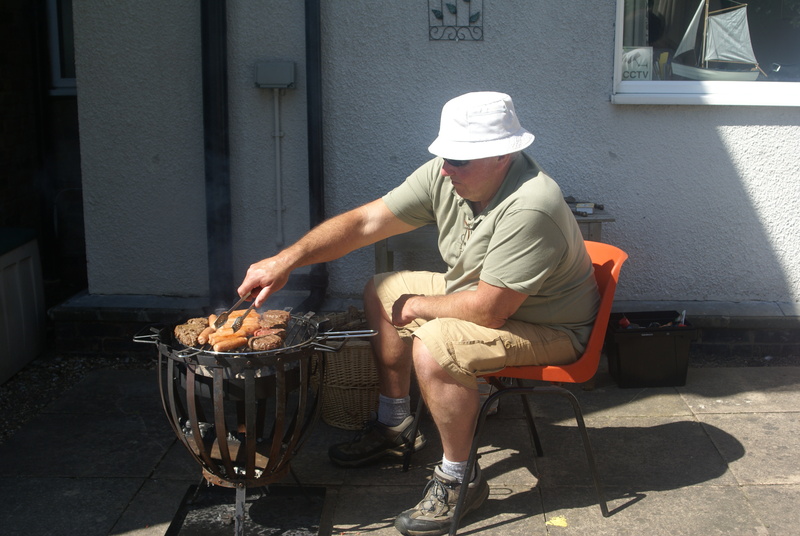 But prayers were answered when we awoke to glorious sunshine and warmer temperatures. We gathered at St. Joseph’s church, Guildford with other candidates from the Deanery. These included St. Joseph’s, Guildford; St. Mary’s, Rydes Hill; St. Pius X, Merrow; Holy Family, Heath End; Holy Angels, Ash; St. Edward the Confessor, Sutton Park; Our Lady of Lourdes, Haslemere; St. Anselm, Hindhead; and St Teresa of Avila, Chiddingfold. Fifty-nine candidates in all along with their sponsors and family; the church was filled with excitement and many happy faces. The music was lovely with a modern, contemporary Christian sound. Bishop Kieran welcomed everyone and put the candidates at ease with his encouraging words. After the liturgy and renewal of baptismal promises, each candidate went forward with their sponsor to be anointed with the Oil of Chrism. The Bishop asked what name they have chosen and with the sign of the cross on their foreheads, he said “be sealed with the Gift of the Holy Spirit”. The service went very smoothly and was well organised for so many people and after Mass concluded, Bishop Kieran kindly posed for photos with each church group and then moved on to individual photos. Our group headed to Rydes Hill Preparatory School for a Vintage Tea Party arranged by the parents of the candidates for an afternoon of lovely cakes, teas, coffee, soft drinks and some nibbles. The twelve confirmed youths from our parishes are: Altea Bertani, Peter Brennan, Rebecca Brown, Catriona Flesher, Isabella Haigh, Claire Hobbs, Lucy Redknap, Natasha Redknap, Samuel Richardson, Sian Besley, Hannah Lodge and Cara O’Dwyer. We wish them much joy and happiness as they continue on their faith journey; and many thanks to Fr David Buckley, Deacon John Edwards, catechists Gloria Benson, Hilary Gray and Lorraine Brown. Below are a few nice pictures of the Confirmation Party which was held at Holy Angels recently. Thankfully the weather was kind on the day and the sun shone and everyone had a wonderful time. 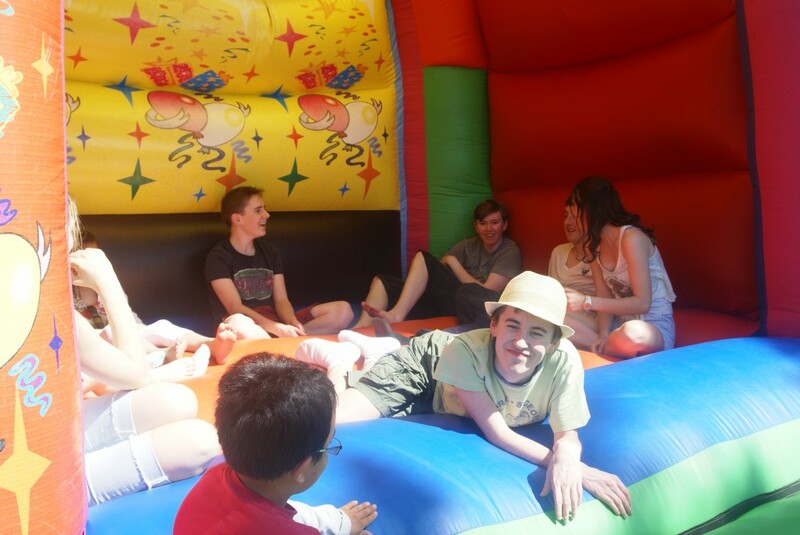 Our young people wished to express their appreciate to Gordon and Kate Veith who very kindly provided the Bouncy Castle on the day. 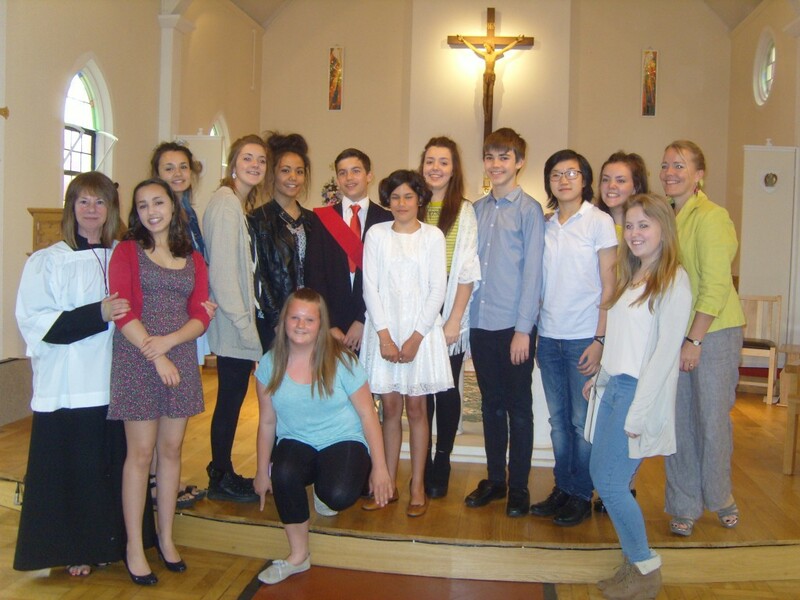 I am sure our young people would also like to express their thanks for all the love and support they have received in their spiritual preparation for their Confirmation from Gloria Benson, Lorraine Brown, Hilary Gray and Deacon John. 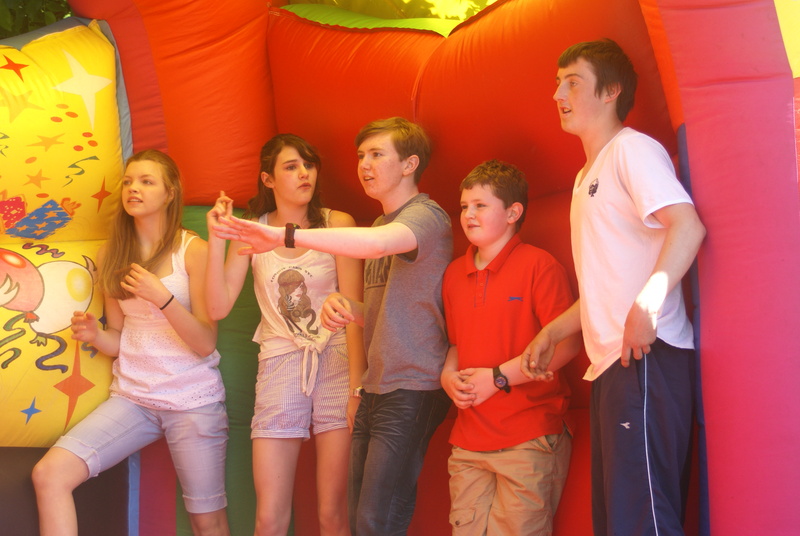 Chilling out on the Bouncy Castle! The weather indeed was awful but the time we did decide to pop out into the town it stayed dry. 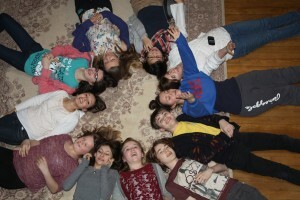 The house was amazing and big enough for 11 young people to play hide and seek. When not in sessions or playing hide and seek the longest hiding individual managed 45 minutes. The piano and singing was the focal point and what a pleasure to see such talent. 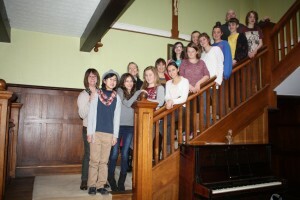 The retreat was at Geo House in Ashurst in the New Forest and is a retreat house belonging to the Montfort Missionaries. Fr Des was great and accommodated us all for reconciliation in his busy schedule. The parishioners prepared a meal for us before leaving on Sunday – all in all a wonderful weekend with catechists and candidates. 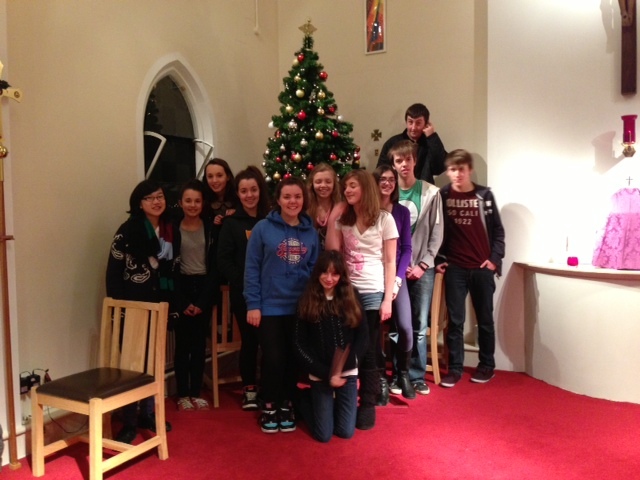 Below are a couple of lovely photos of our Youth Group who once again helped erect and decorate our Christmas Tree at Holy Angels. We would like to thank our Youth for their help in decorating the Tree which looked lovely and also for decorating the Tree with Stars upon which Parishioners were invited to write the name of a loved one who had died and each star was then placed on the Christmas Tree in memory of them at Christmas Time. 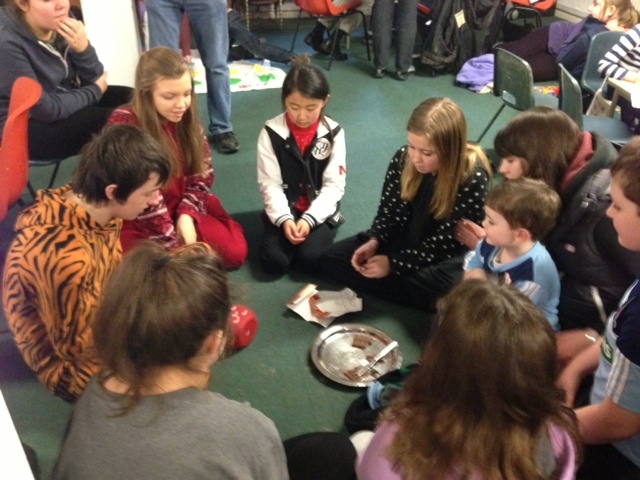 Youth Mass at Holy Family on the 13th January, 2013 followed with a cake sale to raise funds for the Youth Retreat. Thanks to all of you who came to the youth mass, it all went so smoothly thanks to you guys. As for the cake sale. WOW!!! 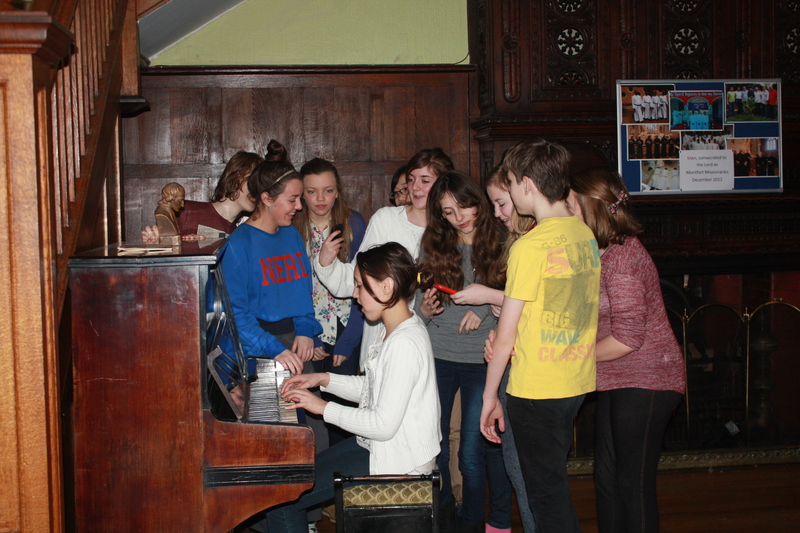 We made £162 towards the retreat, with an extra £10 donated by a very generous parishioner from Holy Angels. Saturday 9th Feb Parish Games Afternoon at Holy Family. 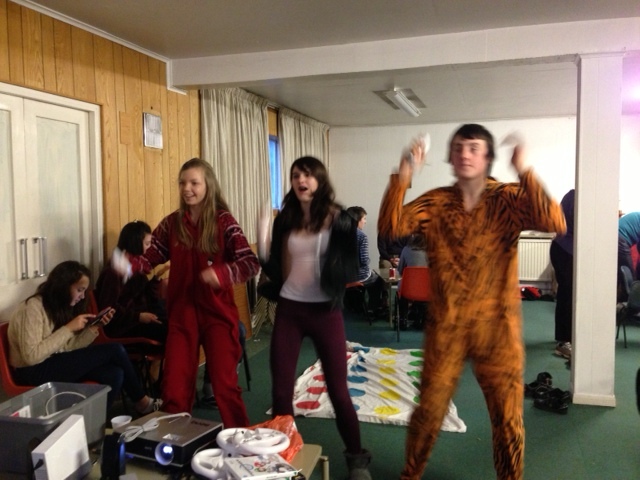 Our youth group held a games afternoon on Saturday 9th Feb at Holy Family church hall. 19 of our youth turned out to set up traditional games and also more modern electronic games. Cards, giant connect 4, scrabble and craft and colouring for the younger children. 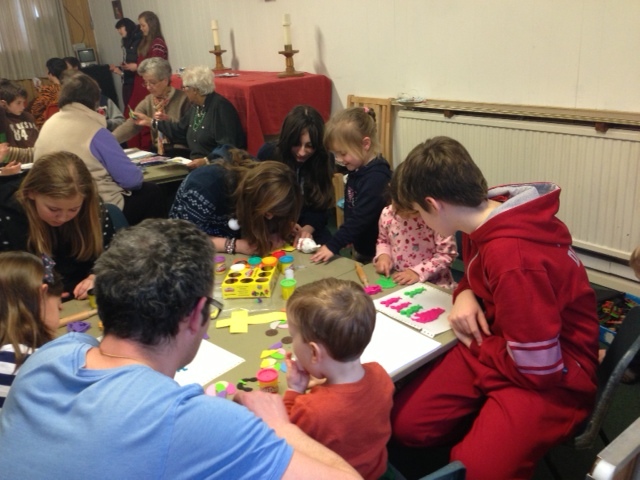 Although you will see from the photos that adults also liked the colouring and craft tables. 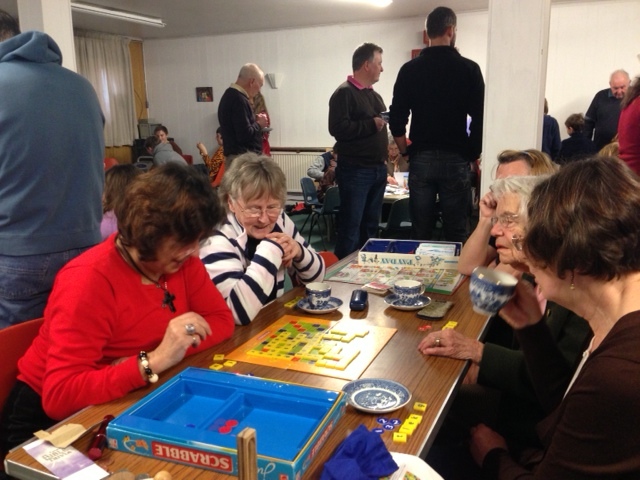 The purpose of the afternoon was to host the games bringing together our young people with parishioners in a fun environment. 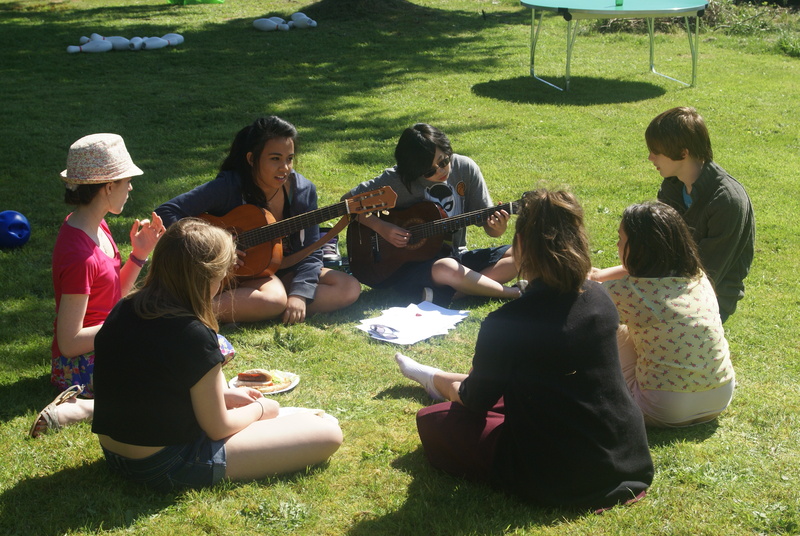 61 people joined in the fun afternoon. Another purpose to the afternoon was to fundraise for the youth’s chosen charities: Step by Step in Aldershot and Hope for Uganda in Uganda of course. 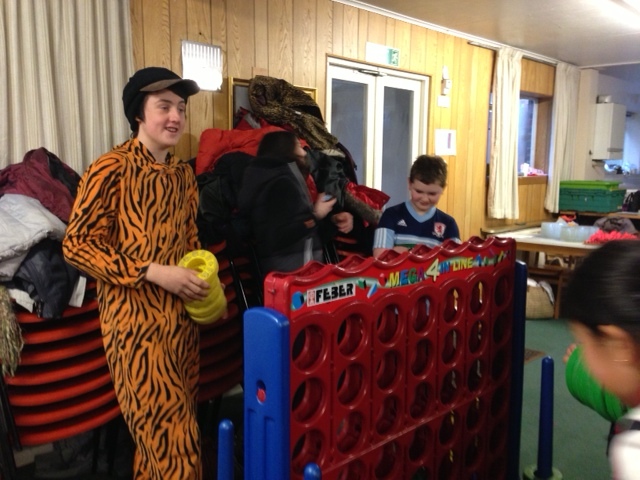 The games afternoon finished with fish n chip supper and brownies and other cakes donated by mums for dessert along with one last fund raiser game of ‘heads n tails’ and not forgetting the raffle where it seemed most of the youth were responsible for picking out the tickets. 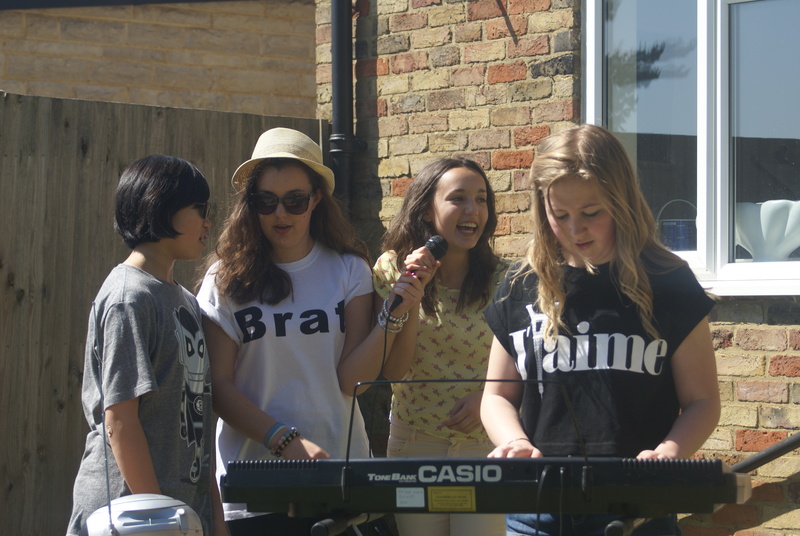 The afternoon raised £200 all due the hard work of our young people and those who joined in the fun. Special thanks to a couple of Dads that worked hard behind the scenes especially Paul the fish n chip runner.